If you like a good cookie but aren’t a fan of the baking process (read lots of bowls, measuring cups and endless dishes), then these Chocolate Walnut Rugalach Cookies are for you! If I’m being honest with you, I’ve sat here the last 2 hours You-Tubing videos on how to work Lightroom, a program that helps edit photos. Fact, I’m more confused than ever and just realized I’ve now wasted 3 of my 5 hours total of nanny care this month on this DIY educational experience. Lesson learned, You-Tube does not solve all yours problems. But, these Chocolate Walnut Rugalach Cookies sure do! Yep, that’s a whole lot of cookies for Miss Hayden and I to enjoy! Just kidding, not quite yet for H! First, they are damn delicious. Alright, alright, it’s time to dive in! 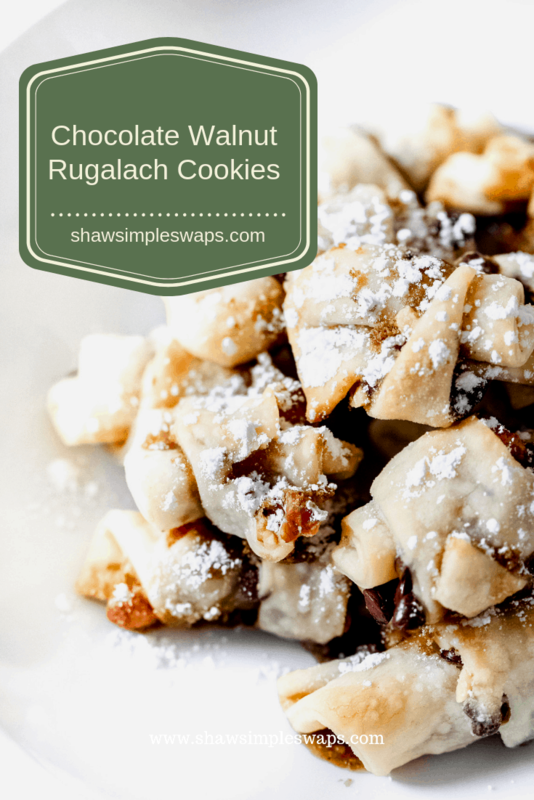 If you like a good cookie but aren't a fan of the baking process (read lots of bowls, measuring cups and endless dishes), then these Chocolate Walnut Rugalach Cookies are for you! Preheat oven to 425 degrees F. Spray a baking sheet with cooking spray and set aside. Sprinkle flour on a flat surface (preferably a marble or granite area). Roll out pie crust so its a flat, large circle. Starting from the outer edges in, sprinkle brown sugar, walnuts and chocolate chips. 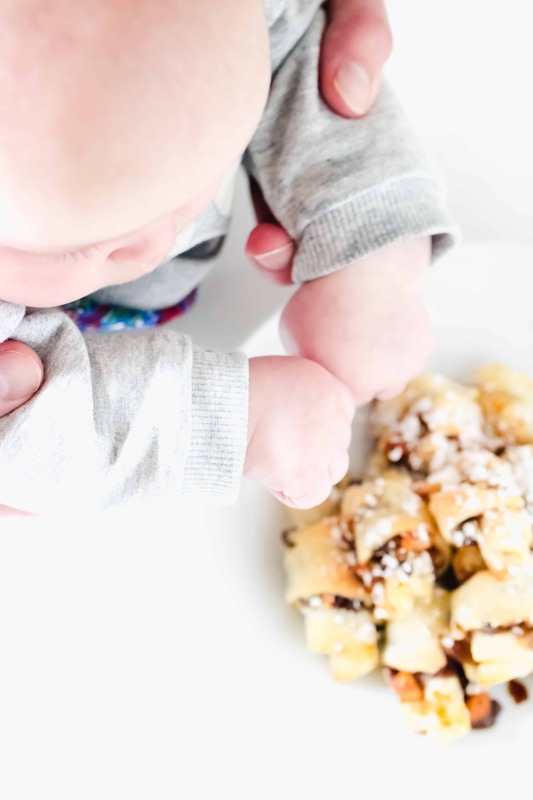 Using the back side of a fork, press the sugar, walnuts and chocolate chips into the pie crust. Take a pizza cutter (or sharp knife) and cut the circle in half, then into fourths, repeating until you have 16 "slices". 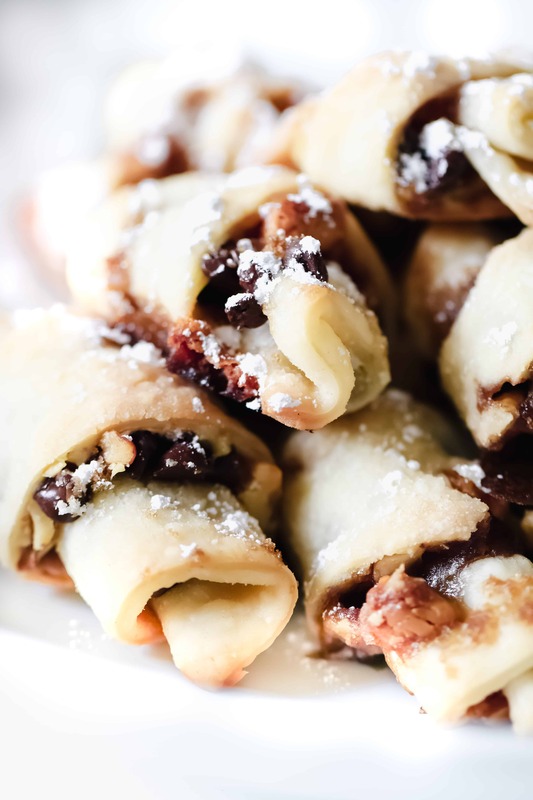 Start at the outer edge of one slice and tightly roll the dough in towards the center, gently pressing the tip of the last piece of dough onto the cookie so the sugar, walnut and chocolate mixture stays nestled inside. Repeat above step for all remaining 15 cookies to be assembled. Place on the baking sheet and cook for 12 minutes. Remove and let cool. 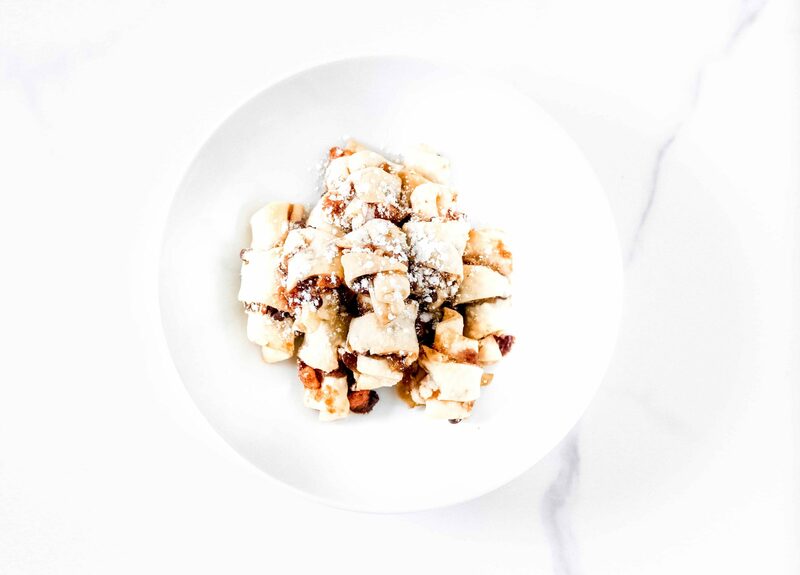 Sprinkle with powdered sugar, enjoy! Can be made gluten free by using a gluten free flour and gluten free pie crust. Have you ever made Rugalach before? What’s your favorite cookie to enjoy over the holiday season?! For more inspiration, be sure to check out the assortment of delicious cookies from my friends below! We’re hosting a Virtual Cookie Exchange over on Instagram so be sure to stop by and visit! These are so festive and perfect for the holidays! WOW! What a simple recipe that makes the most delicious cookies! First time making these they were sooo good!! Thank you! These look SO good and I LOVE that they are ready in just 20 minutes. Wait until Miss H is 4, you will know why cookie time needs to be short and sweet 😉 Can’t wait to enjoy these this year! The struggle is real with the photo editing–lots of hours lost here as well. But these cookies?? Not wasting any time getting pie crust to make these! These look amazing. Pinning for later!